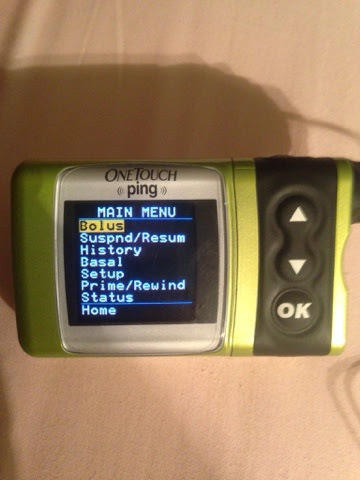 I have my insulin pump and my continuous glucose monitor (CGM) hooked up and working! I love them. The CGM is great since I don't notice when my blood sugar is low until it is REALLY low (we're talking in the 30s or lower here :O ) For those lucky readers who know nothing about diabetes, your blood sugar is supposed to be from about 70 or 80 to about 140. You may have experienced what I like to call hungry feeling. If you experience this you often get hot, unable to think hard or focus, shaky, and of course super hungry, usually for sugary foods. This feeling means your body is experiencing a low blood sugar. Your body can usually correct this and most healthy people would not pass out or die from this, however a person with diabetes takes insulin to bring blood sugar down, which when too much is taken can result in an extreme low causing the person to pass out and even die. In fact we (diabetics) have to carry a special syringe with us incase we pass out from a low, kind of like an EPI pen only ours gives our body the quick burst of energy it needs. I have never passed out (knock on wood!) though I have been as low as 27 :O (yikes!) Like I mentioned above I don't notice my lows until I am really low, this feels awful and isn't good either. 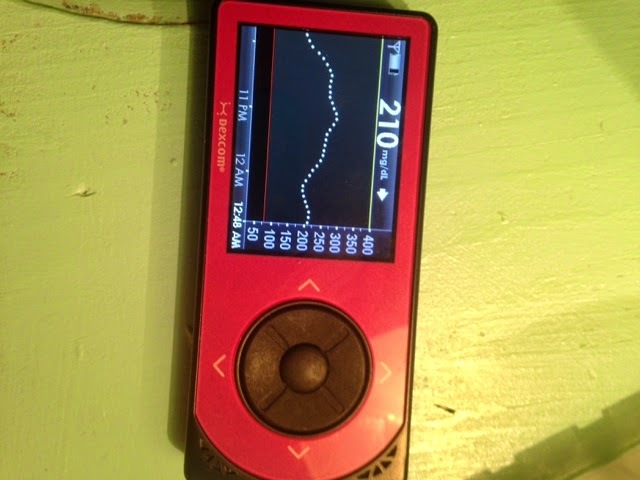 Enter Dex, my continuous glucose meter. This handy little invention goes under my skin and sends a blood sugar reading to a hand held device every 5 minutes. It shows me trends which are helpful in adjusting my insulin doses as well as to know when I must eat. Twice my CGM has alerted me of an impending low before the symptoms hit, allowing me to eat some quick carbs and fix the problem before I started to feel like crap! My next new "toy" is pumpie, my lovely insulin pump. 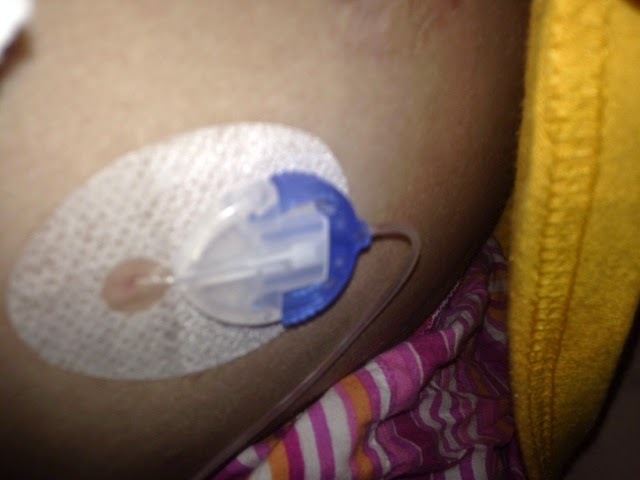 The pump has a little tube that goes into me and stays there, hooked up to a little device that has insulin in it and can give me insulin throughout the day without any pokes! I also have the ability to enter my carbs that I eat to get insulin for my food. Before my pump I used to have to give myself a shot every time I ate, this tended to drive me away from food. For instance with dinner say we are having pasta, I would have to decide at the beginning how much I would eat and then give myself the insulin needed. inevitably I would wind up still hungry and want another serving or "surprise" there is super yummie chocolate cake for desert. When this would happen I would either have to deny myself the delicious food (not a great idea when you are trying to gain weight) or give myself yet another shot. (not a whole lot of fun) With the pump all of that is gone, I can now eat and eat and eat without a single shot, just a few pushes of buttons on pumpie and boom more insulin is sent right into me! Chocolate cake you say? Bring it on!!! !